Wine On Wednesday is back! It’s been over a month since my last post on wine and, frankly I needed to detox a little. 😉 In all seriousness, where has the time gone? I feel like school just started, but soon it will be a month that my oldest has been back with her classmates. Then I thought that with school starting I would have plenty of time to write. Ah, no. Extracirricular activities, homework, volunteering at school, etc. Where the heck is the pause button?! So this wine was a gift from a dear friend along with a very cute wine glass for simply picking up her mail and watering some plants while her family went on vacation over the summer. Michelle Y, I will gladly do that for you any day and a gift is never expected or necessary… but always appreciated. 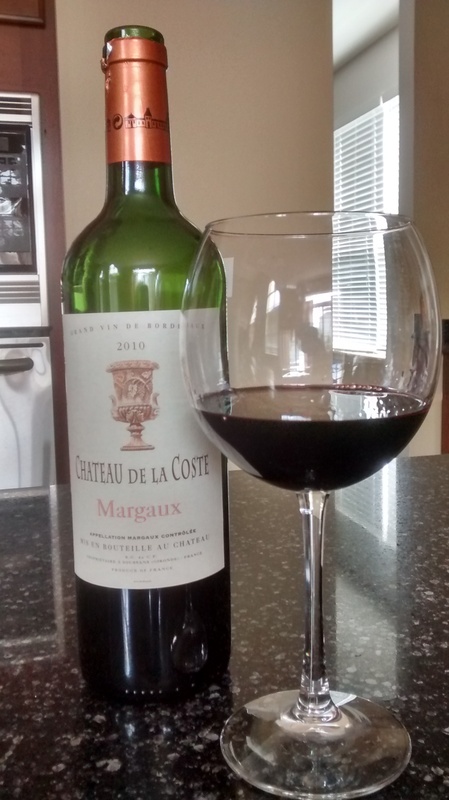 This wine is produced in the Margaux appellation of the Bordeaux region. This wine is soft, subtle and elegant with flavors of lush berries and a hint of cinnamon. The blend is 50% Cabernet, 45% Merlot and 5% Cabernet Franc. A very easy wine to drink with asparagus wrapped in prosciutto, mushroom risotto or pair with Montrechet (goat) cheese. 🍷🍷🍷 out of 4 wine glasses. Credit: Edvwines for their serving suggestions.